Hope your holidays were filled with lots of good times with friends and family. While the MaPaw pups took a bit of time off to celebrate, they were very eager to get back to work and find some homes for our available dogs. 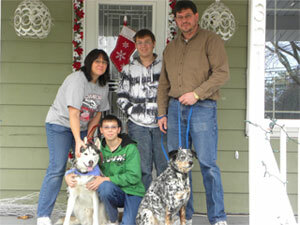 On Monday (December 27th), Tawney’s Christmas wish came true when she was adopted to her furever home. Tawney had been with her foster home since October and was patiently waiting for her very own home. She’s a really cool gal who loves everyone she meets. Her foster family was very sad to see her go, but happy to see Tawney get adopted. Congratulations to Tawney and her new family! Cyrus decided to start off 2011 by being adopted! That’s right ~ Cyrus found his furever home and joined them today. As you may remember, Cyrus was originally adopted from MaPaw 2 years ago but came back when his family’s work schedule changed and Cyrus was spending too much time alone. While his new family and canine sibling met Cyrus before the holidays, they wanted to wait until after the holidays so that Cyrus could settle into his new home without the stress holidays and travel can bring. Congratulations to Cyrus! Before I sign off for the evening – a couple quick notes. The preliminary tally for Katie’s Challenge shows that we received $5475 in donations plus the $5000 matching funds from Katie’s Dad for a total of $10,475. That is amazing!!! What a great way to start 2011 for the pups of MaPaw! 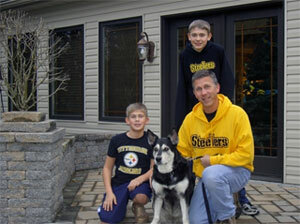 In 2010, MaPaw brought 56 dogs into our foster homes and found homes for 49 dogs. We are looking forward to helping even more dogs in 2011! It’s Time for an Update on Ben!